Thursday, December 13, 6 – 8 p.m.
On Thursday, December 13, the African American Museum in Philadelphia invites to you join us for the special lecture and conversation with Philadelphia-based photographer, master-printer and visual artist, John E. Dowell. For this free public lecture, Dowell expounds on the historical and contemporary themes found within his exhibition, Cotton: The Soft, Dangerous Beauty of the Past. Doors open at 6 p.m. for an opening wine and cheese reception. The lecture will begin promptly at 6:30 p.m., and will be followed by an audience Q&A. The 35 large-scale photographs, installation and altarpiece featured in Cotton: The Soft Dangerous Beauty of the Past explore the dichotomy between the beauty of the plant, and its inexorable link to the horrors of chattel slavery in the U.S. The exhibition also evokes the often overlooked history of slavery in the North, specifically in New York City. Dowell meticulously documents cotton as a symbol to channel ideas, dreams and fantasies—and as a portal to communicate with ancestors and with the viewer. John E. Dowell is a Philadelphia based, nationally recognized artist, master-printer and photographer. A professor Emeritus of Tyler School of Art at Temple University, for more than four decades, Dowell’s fine art prints, paintings and photographs have been featured in more than 50 one-person exhibitions and represented in the permanent collections of 70 museums and public collections, including the Museum of Modern Art and the Metropolitan Museum of Art in New York City, the Museum of Fine Arts, Boston, the San Francisco Museum of Modern Art and the Bibliothèque Nationale in Paris, France. Romas Viesulas, world-renowned master printmaker, has never exactly been hailed in his adopted home of Philadelphia. It’s not that Viesulas was ignored during his lifetime. When he died suddenly in Rome of a heart attack in 1986, he was a professor of printmaking at Temple University’s Tyler School of Art and director of Temple Abroad in Rome. He had received three fellowships from the Guggenheim Foundation. He represented the United States at the Venice Biennale in 1970. His work is in museum collections around the world (including the Philadelphia Museum of Art). But Allan L. Edmunds, founder and president of the Brandywine Workshop and Archives, has long felt Viesulas has never been properly recognized here, in the city where he finally settled after fleeing Lithuania ahead of the Nazis and the Russians in the 1940s. At 4:30 p.m. on Wednesday, a panel will be held at Temple to discuss the impact of the immigrant on art and culture in the United States. The ambassador of Lithuania, Rolandas Krisciuna, will be on hand. Scholars, artists, and Viesulas family members will also be there. “Romas Viesulas: Master Artist-Printmaker,” a survey of the artist’s work, is now on view at the Brandywine Workshop, 730-32 S. Broad St. It runs through Dec. 29. (An exhibition of Viesulas’ work recently closed at the Lithuanian embassy in Washington, where it served to celebrate the artist and the centennial of modern Lithuania). As far as Edmunds is concerned, such recognition has been a long time coming, and the virtues it celebrates are in short supply these days. Artist John Dowell, whose manipulated photographs exploring cotton are currently on view at the African American Museum in Philadelphia, studied with Viesulas at Tyler in the 1960s. “There was complete acceptance of me by Romas,” Dowell said. Significantly, Viesulas helped pave the way for Dowell to become the second person to earn a printmaking residence and certificate from the famed Tamarind Lithography Workshop in Los Angeles (and the first African America to do so). In 1970, on Viesulas’ recommendation, Dowell became the first African American to become printmaker-in-residence at the Venice Biennale. “I had never been out of the country before!” said Dowell, who grew up in the Richard Allen homes of North Philadelphia. It’s not that Romas sought out young African American artists. He sought out talent and embraced it, Dowell and Edmunds agreed. He was an immigrant, devoid of ethnic and racial prejudice and sympathetic to excellence. Viesulas arrived in Philadelphia at a low point in his life. He had escaped from Europe and eventually made his way here, initially as a temporary replacement at Tyler. But the teacher he replaced never returned and Viesulas stayed on, becoming chair of the printmaking department. In his work and in his life, he dismissed the superficial. 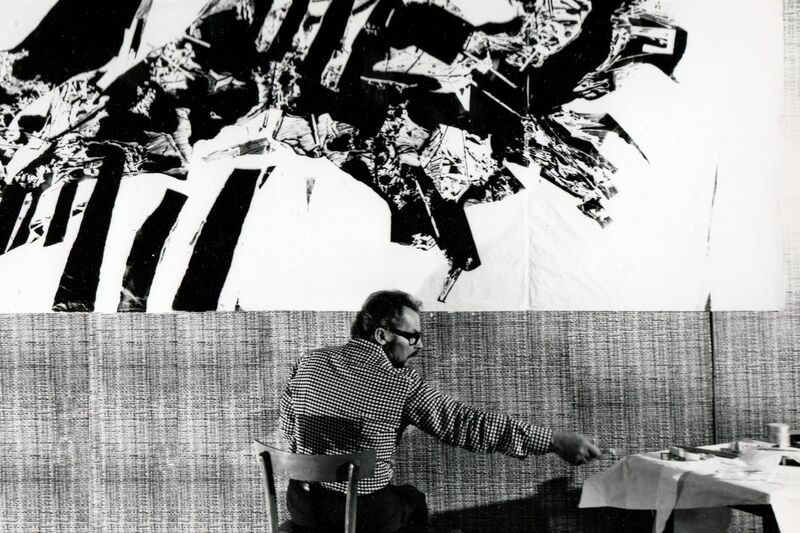 “The human drama, the human condition — that element has always permeated my art, and in my life I have completed only a couple of complete abstractions,” Viesulas said in an interview in the 1970s. Panel discussion “Romas Viesus and the Impact of Immigration on Art and Culture,” 4:30 p.m. Weds., Nov. 14, Temple University Science Education and Research Center, 1925 N. 12th St., Room 110A/B. Art exhibit “Romas Viesulas: Master Artist-Printmaker,” through Dec. 29, Brandywine Workshop, 730-32 S. Broad St., brandywineworkshopandarchives.org, 215-546-3675. The Cathedral has been blessed by the presence of a growing number of visual artists who have shared their creative journeys as members of the congregation. 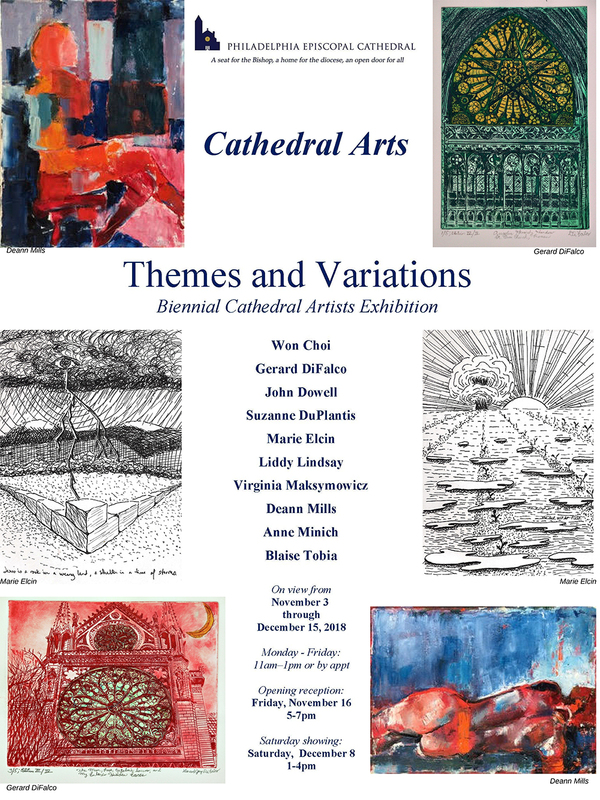 To celebrate these gifts of the spirit, the Cathedral Arts program devotes an exhibition every two years to their work. There is a common tendency among artists to return to certain subjects again and again, even as their artistic approaches change and develop over time. These subjects, or “themes” can be figures either real or symbolic, or visual ideas having to do with color, texture, line, or form. This exhibit prompts us to ask: Why do artists keep returning to these ideas as if there is something they haven’t completely worked out for themselves? What do they see in our world that we might be missing? We hope this exhibition will open our eyes to a few of the infinite ‘variations’ of the abundantly diverse elements of the divinely created world we share. Race, Myth, Art, and Justice celebrates a community of voices who illuminate how art continues to serve as a powerful tool for justice. As part of CCCADI’s commitment to public engagement and collaboration, the curators invited thirteen dynamic scholars, activists, artists, and writers to reflect on the exhibition’s works. Through their thoughtful framing, we witness how the images transcend limiting labels of “political,” “radical,” or “protest” art. These photographs are not merely gestures or symbolic meditations on race and justice. Instead, they reflect exclusion, erasure, and invisibility as the lived realities we wrestle and resist every day. Kwesi Abbensetts, Faisal Abdu’Allah, Terry Boddie, Jonathan Gardenhire, John E. Dowell, Jr. Adama Delphine Fawundu, Deborah Jack, Zoraida Lopez-Diago, Radcliffe Roye, Stan Squirewell, Ming Smith, Deborah Willis. The opening reception will debut the exhibition and will feature remarks by our new Melody Capote, Executive Director, curators, artists, and a festive reception. The Caribbean Cultural Center African Diaspora Institute (CCCADI)preserves and presents African Diaspora cultures; trains the next generation of cultural leaders; and unites Diaspora communities. We leverage arts and culture as tools for personal transformation, community-building, and social justice. Major support for the exhibition has been provided by The Andy Warhol Foundation for the Visual Arts and The Ford Foundation, with additional support from the New York State Council on the Arts and the New York City Department of Cultural Affairs. Janyce Glasper offers a poetic reflection of John Dowell’s current exhibition at the African American Museum of Philadelphia, Cotton: The Soft, Dangerous Beauty of the Past. On view through January 21, 2019, this installation of large-scale prints and medium-format digital collages explores slavery, not as a particularly southern phenomenon, but as an institution that haunts our nation from Alabama from Wall Street. What’s more, Dowell uses the symbolic force of cotton to carve out a space for personal reflection and collective celebration. John Dowell’s Cotton: The Soft, Dangerous Beauty of the Past on view at the African American Museum of Philadelphia is a multi-sensory experience that pulls visitors in through strong visuals and attentive listening. John Dowell, “Lost in Cotton”, print on Taffeta. From “Cotton: The Soft, Dangerous Beauty of the Past” at AAMP. Photo by Janyce Denise Glasper. One cannot dismiss the unhealed wounds that slavery has burned into the fabrics of America and other countries around the world. Dowell articulately combines two mediums — photography and printmaking — to develop complex dialogue on cotton and its role in history. Cotton occupies either the pinnacle focus or relegates into the background as a secondary element, collaged alongside digital drawings and strategic bold text. The most intriguing compositions superimpose cloud-like cotton over images of young black Harlem residents reading and dreaming. Dowell’s research on Seneca Village — a 19th century settlement of free blacks upon which Central Park was built — provides a significant parallel to the current turmoil of Harlem’s gentrification. In The Poet, a child holds a white paged book and a microphone. Rows and rows of sunlit cotton around him suggest spiritual reverence and emotional homage. The abundant, personified cotton serves as audience, attentive and affectionate to the orator. I spoke with Dowell adjacent to Lost in Cotton, a constructed maze of digital prints on hanging strips of taffeta. “When my grandmother was a little girl, she got lost in a field of cotton,” he explained. “Down outside Augusta, technically South Carolina, cotton grows five feet tall, which is very rare.” A sign asks the spectator to enter the maze between the strips and move clockwise towards the open center. Once inside, splendorous high cotton portraits surround and confound the tight space, resonating with the psychological plight of Dowell’s lost and petrified ancestor. “I’m using cotton as a symbol for the black body and the actual places [black bodies occupied].” Dowell uses cotton — one of the most humiliating symbols of slavery — to uphold and celebrate black survival. Fertility, strength, and healing are united in jarring closeups of plump cotton bolls that leap from saturated archival prints while soft, haunting hymns and work songs drift in the background. Dowell’s digital prints range in scale from framed mid-sized pieces to massive panoramic shots on unstretched canvas. These compelling cotton landscapes eulogize the forgotten, the voiceless. He has captured and bestowed new meanings, redefining the cause of tremendous, generational pain. For example, Up Close is a sophisticated compilation, a sequential medley of images combining striking saturated colors and intense shots of cotton thriving in nature. Butterflies situate atop the snowy whiteness, marigold and black wings enhancing the stark, ordinary cotton. In a nook on the third floor, there is an area to rest and draw breath, to reminisce, to hold and feel the weightlessness of cotton and its brittle leaves. Viewers are also allowed to bring in old photographs and place them on the altar framed by tall cotton plants, to honor their families in a collective embrace. Dowell’s Cotton: The Soft, Dangerous Beauty of the Past is awe and sustenance, a reflection on a fluffy plant and its grisly impact on past and present black lives. The whole breadth of this sincere and educational show is a love letter addressed to the wonders of the human condition — a love letter that confesses yearning, compassion, and victory. “Cotton: The Soft, Dangerous Beauty of the Past” is on view September 15, 2018 — January 21, 2019 at The African American Museum of Philadelphia, 701 Arch St, Philadelphia, PA, 19106. Museum hours are Wednesday thru Saturday 10-5pm and Sunday 12-5pm. Contact AAMP at (215) 574-0380. Artist John Dowell holds a bowl of cotton bolls while standing before the enormous photographic print that welcomes visitors to his show, Cotton: The Soft Dangerous Beauty of the Past at the African American Museum in Philadelphia. She was long gone, but she came to him in a dream. Artist John E. Dowell Jr., 77, Philadelphia born and bred,said it all came down to Big Mommy. 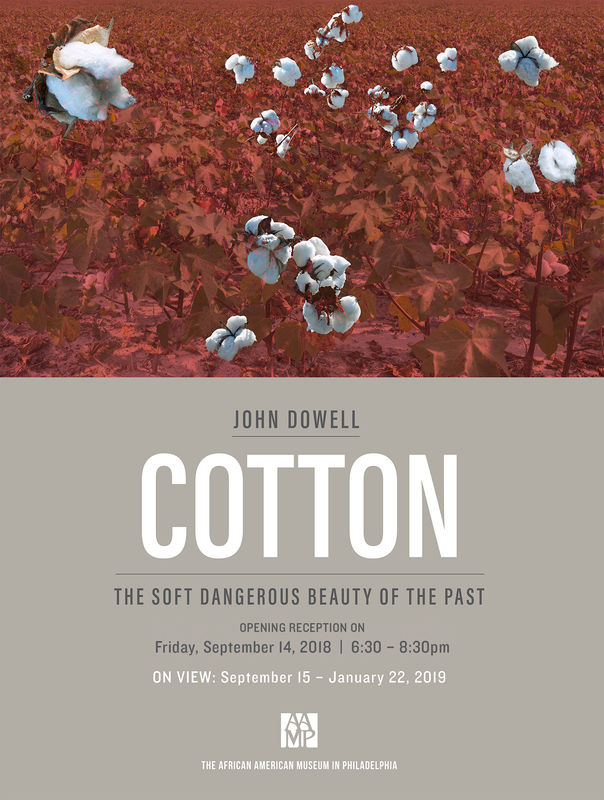 “I had this dream, a series of dreams, three months before I had a show in Savannah back in 2011,” Dowell said the other day while standing in the midst of his extraordinary new exhibition, Cotton: The Soft, Dangerous Beauty of the Past. John E. Dowell Jr.’s “Getting Ready, Virginia Cotton,” at the African American Museum in Philadelphia. The exhibition of vivid photographs of cotton plants, cotton fields, and the ghosts of cotton, many collaged and profoundly manipulated, just opened at the African American Museum in Philadelphia, Seventh and Arch Streets. It runs through Jan. 21. Dowell, a slight man with a sparkling laugh, said that, about two or three weeks later, he had another dream. Big Mommy, who grew up near Augusta, Ga., told a memorable tale of children — and herself — becoming lost in fields of towering stalks of cotton, cotton looming, cotton everywhere, as thick as any endless, foreboding woods. So began Dowell’s journey into what was the alien world of cotton, seemingly so antithetical to his urban own world of the Richard Allen Homes and decades of teaching at Temple’s Tyler School of Art. But he felt in his bones the vast power and terrible beauty of this potent plant, and understood that he had to know cotton, as an artist and a photographer — and perhaps most profoundly as a black man. A hanging installation by John E. Dowell Jr. at the African American Museum in Philadelphia. In the midst of his first visit shooting near Augusta, the farmer who showed him around proudly told Dowell that the cotton fields had been in his family for seven generations. Some things, as his exploration of cotton continued, Dowell had never even heard of, particularly when he began thinking about slavery in the north. The Wall Street slave market, for instance, was one of world’s most active selling blocks for most of the 17th and 18th centuries. But by the 1820s, freed Africans were able to buy plots of land in what became known as Seneca Village, a largely black community in what is now Central Park. From 1825, blacks and some Irish and German families bought land there and built homes. The city swept it all away with the power of eminent domain to create Central Park. Nothing remains visible of Seneca Village, not the houses, the three churches, the school, the businesses. Visitors look at one of John E. Dowell’s ghostly renderings of Seneca Village, a black community obliterated to make way for Central Park. Dowell photographed the area and in some of his most powerful prints, he drew buildings on their exact sites, ghost houses and cotton haunting the park. There is the home of Andrew Williams, for instance, the first settler, who bought his land and built his simple house in 1825. In Dowell’s photograph, he shows the spectral Williams house surrounded by vivid cardinals, “spirits,” Dowell calls them. Another print shows the house of Williams’ neighbors, levitating. Nearby, the African Union Church sits, cotton laid at its doorstep, bursts of cotton flying from its rooftop, an explosion of hallelujahs. “I wanted to show the spiritual,” Dowell said. The same idea inspired his interior shot of Trinity Church near Wall Street, which sometimes allowed black people to be buried in its cemetery, and often barred them. John E. Dowell Jr.’s “Sending the Message” at the African American Museum in Philadelphia. 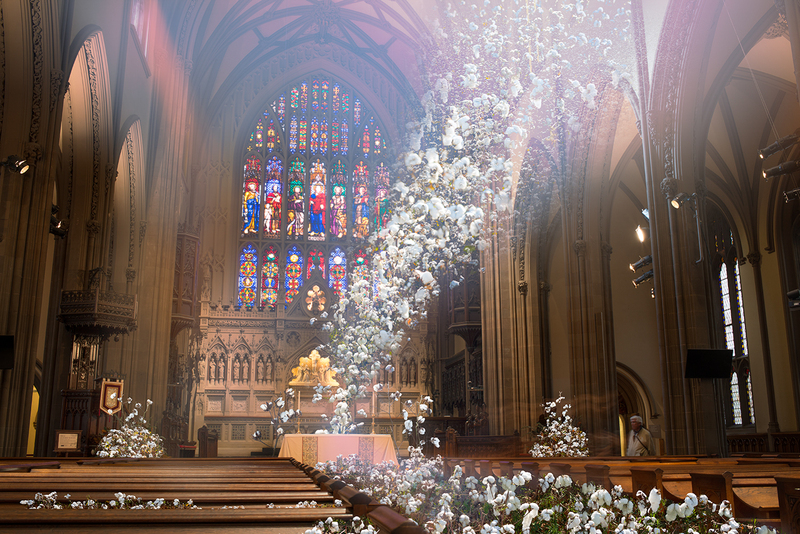 Cotton pokes its way above pews in Dowell’s photographic vision; it comes streaming through the windows like angels in Renaissance paintings. I superimposed cotton on [the interior],” he said. “But what it’s about is that, OK, we’re just equal like everybody else, you know, nothing special. Just give us a shot like everybody else. The message is: You could bury us. You could. I just want people to remember and to think about what happened there. In the summer of 2011, John Dowell started having dreams about his grandmother, Big Mommy. After the second dream, his sister warned him that Big Mommy wanted something. Dowell remembered that his grandmother, long since passed, had told him that when she was very small – 4 or 5 years old – she got lost in a dense field of cotton. Dowell is a professor emeritus at the Tyler School of Art at Temple University, not far from where he grew up in the Richard Allen housing project in North Philadelphia. He’s a city guy. He knew the history of slavery in cotton plantations in the South, but he had never actually been in a cotton field. “Cotton: The Soft, Dangerous Beauty of the Past” is an exhibition of Dowell’s photography now on view at the African American Museum in Philadelphia. In order to appease the spirit of his grandmother, Dowell – a former Voodoo priest – visited cotton farms in Georgia to take pictures. 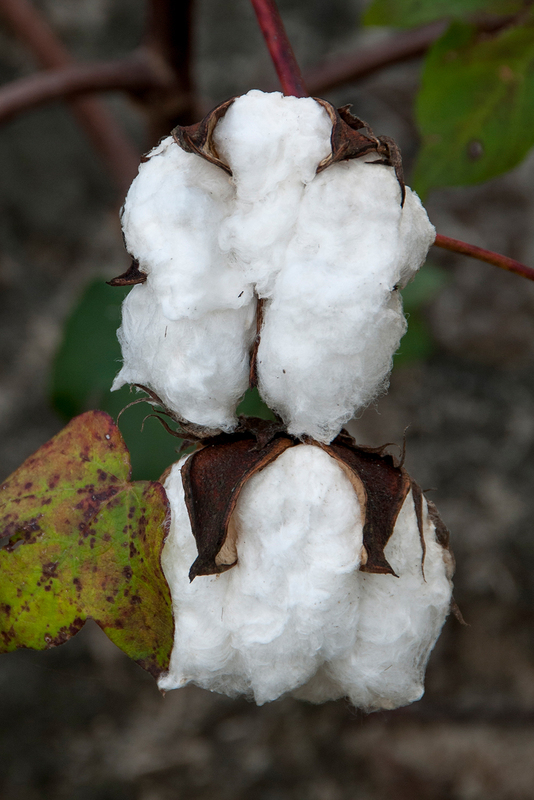 As cotton grows, the plants become extremely dense. Dowell’s camera goes deep into the thickly entwined stalks where it is easy to imagine a 5-year-old girl becoming desperately lost. He catches “second-day” cotton when it sprouts a roselike flower, and “perfect” cotton when its hard shell splits into a five-point star. The exhibition features a shrine to his grandmother, with baskets full of raw cotton still on the stem. Visitors can hold the white puff – surprisingly heavy – and pull its strands into a feathery tuft. Cotton also has an ugly history. As a young nation, America needed to establish its own industries to distance itself from British trade. The American cotton textile industry was an important step toward economic independence. It was able to thrive, in large part, because of slave labor. Dowell’s approach is part history lesson, part personal mythology, and part straight-ahead botanical photography. It adds up to a surreal vision of cotton. He digitally manipulated his large-scale pictures to imagine cotton as ethereal or menacing or subversive. A set of pictures taken in Manhattan is superimposed with fields of cotton, in reference to Seneca Village, a thriving African-American community that was once in the center of the city. In the 19th century, through eminent domain, the land was seized then razed to make Central Park. The photos show dense fields of cotton choking the parks, avenues, and storefronts of New York. People caught in Dowell’s photos appear to be drowning. He likes to imagine that the plant had a sympathetic feeling for the slaves picking cotton, and proactively – with whatever powers inherent to the plant — tried to aide them in their plight. To illustrate that vision, the exhibition will feature a dance developed by Dowell and choreographer Gary Jeter, personifying cotton. It will be performed in the gallery on Oct. 3 and 5. A solo exhibition of my cotton work will open in September at the African American Museum in Philadelphia. John E. Dowell is a Philadelphia based, nationally recognized artist, master-printer and photographer. A professor Emeritus of Tyler School of Art at Temple University, for more than four decades, Dowell’s fine art prints, paintings and photographs have been featured in more than 50 one-person exhibitions and represented in the permanent collections of 70 museums and public collections, including the Museum of Modern Art and the Metropolitan Museum of Art in New York City, the Museum of Fine Arts in Boston, the San Francisco Museum of Modern Art and the Bibliothèque Nationale in Paris, France.